Bayview Fantastic X67 (P) - Smooth lean Royalla Walter Little son. He exhibits high milk traits which are passed on to long bodied females. Bayview George W23 (P) (TWIN) - Slick coated well muscled Royalla Walter Little son. Breeding on well, producing progeny with the same coat, muscle patterns and doing abilities as himself. The Bank Donkey Kong D4 (P) - Soft calf with great topline and strength of spine. Sired by Marrington Bottler B67. 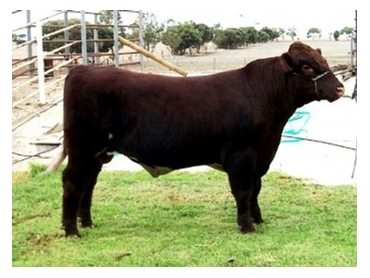 Was used over madien heifer before selling at 2010 Dubbo show and sale. Bundaleer Yankee Crusier Y2 (P) (ET) (AI) - Extremely soft Waukaru Goldship (IMP USA) son, used in 2008/09 drop. He produces soft fleshy high milking females.